The Loyal Edmonton Regiment and its predecessors have a remarkable record of service and sacrifice covering most of the twentieth century and continuing into the twenty-first. Indeed, their history extends back to 1908 and the establishment of the 101st Edmonton Fusiliers, Alberta's first infantry regiment. George F.G. Stanley, Canada's most eminent military historian, subtitled one of his best known works, Canada's Soldiers, "The Military History of an Unmilitary People." With all due respect to Professor Stanley, I think a more accurate characterization would be "an unmilitaristic people." Canada has never entered a war in anything resembling a state of readiness, yet in the great conflicts of the twentieth century Canadians have fought as bravely and competently as any of their allies or foes. If rapidly learning the lessons of the modern battlefield and putting them efficiently into practice is the test, Canadians have shown themselves to be quite a military people. The history of The Loyal Edmonton Regiment is a perfect example. Raised in a place as remote from the great conflicts of modern world history as anywhere on the planet, the regiment's soldiers compiled a superb record of combat on the deadliest battlefields of human experience. In the last half century of relative peace, they have embodied Canada's traditional efforts to keep peace in the world. City of Edmonton Archives (Loyal Edmonton Regiment Collection, A96-215, Box 53, 27991). 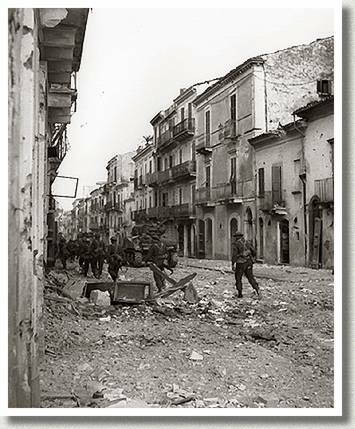 Soldiers of The Loyal Edmonton Regiment, Ortona, Italy, 23 December 1943. The Loyal Edmonton Regiment, or the 49th Battalion or The Edmonton Regiment as it was known at various times before 1943, earned an exemplary battle record over the course of three wars.